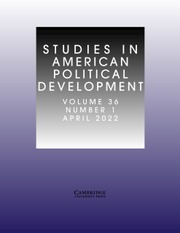 Studies in American Political Development (SAPD) publishes scholarship on political change and institutional development in the United States from a variety of theoretical viewpoints. Articles focus on governmental institutions over time and on their social, economic and cultural setting. In-depth presentation in a longer format allows contributors to elaborate on the complex patterns of state-society relations. SAPD encourages an interdisciplinary approach and recognizes the value of comparative perspectives.